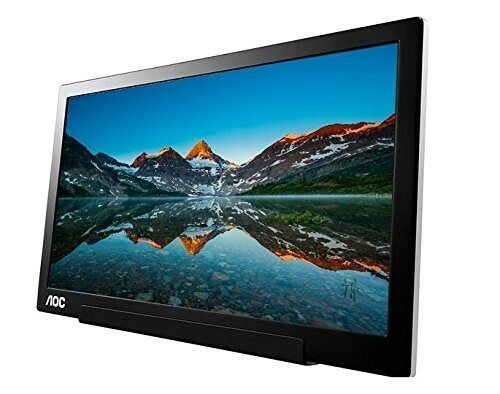 Bottom line: If you’re on the go a lot and want some extra screen real estate for your laptop, it’s hard to go wrong with AOC’s USB-C monitor. When I take my laptop out in the world, work slows down a lot. This is a first world problem, but if I’m writing up an article of a new phone and I’m referencing the manufacturer’s press material, I type a bit, change back to the manufacturer’s site, go back to typing a bit, and so on. It doesn’t sound like a lot, but the time switching back and forth between windows adds up. I could pin each window to the left or right side of my screen as I do on my desktop, but this is impractical on a small laptop screen. Portable monitors have been around a few years to solve this problem, and two months ago I began using one from AOC. This model has a 15.6-inch screen and a single USB-C port for both power and video. 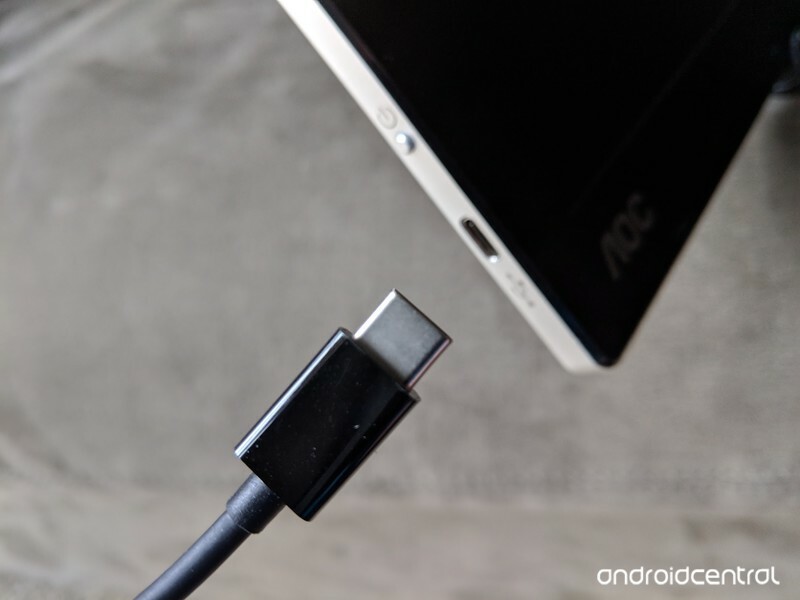 If you have a newer Windows laptop, Chromebook or Macbook with a USB-C port, you’re good to just plug the monitor in and go about your merry way. If you don’t, there is a driver CD (yes, a CD) included to connect the monitor to a USB-A port. The monitor itself is lightweight, coming in at under two pounds. It’s been living in my backpack since day one, and I’ve never had any discomfort with the extra weight. The 15.6-inch screen is more than enough for productivity, especially when combined with my laptop’s screen. The 1080p resolution may not be enough for some photo and video editors, but I imagine those folks would prefer their laptop’s screen for those tasks anyway. If I had one minor complaint about this panel, it’s that outdoor visibility could be better. This is an IPS panel, so viewing angles are much better than older TN panels. Colors are accurate as well, at least to my eyes. If you’re interested in gaming on this external screen, do note that its refresh rates is “only” 60hz, but the 5ms response time should help you pwn plenty of noobs. One obvious but important note is because this monitor is getting its power from your laptop, it will drastically reduce your laptop’s battery life. If you need your laptop to last through the night, consider leaving this monitor in your bag. If I had one minor complaint about this panel, it’s that outdoor visibility could be better. There’s surprisingly little glare, but it doesn’t get bright enough for some of the sunny days I’ve had recently. I mostly write in record stores and bars, so that’s not a huge loss for me. A major complaint I have about this monitor — and the external monitor marketplace as a whole — is there’s no 3:2 option. 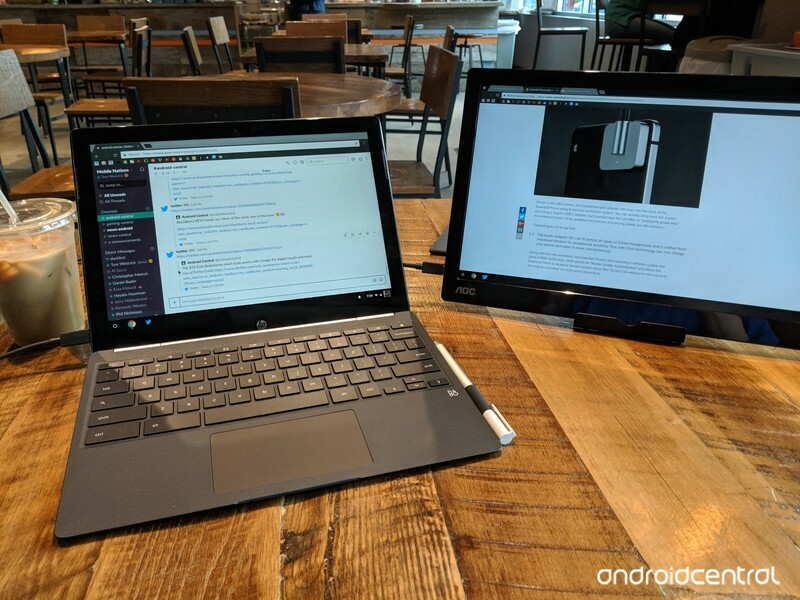 My Pixelbook has a 3:2 screen, and if I ever go back to a Windows laptop that’ll have a 3:2 screen too. 3:2 displays are simply better for productivity, while still being great for content consumption. Going back and forth between a 3:2 screen and a 16:9 one isn’t the end of the world, but it’s a little janky. I don’t blame AOC or other manufacturers for going with 16:9, since a vast majority of laptops use that aspect ratio. I just wish there was a 3:2 option available. The external monitor comes with a soft cover that attaches with a magnet, Surface Pro style. This cover is also supposed to function as a stand, but it’s much more trouble than it’s worth. 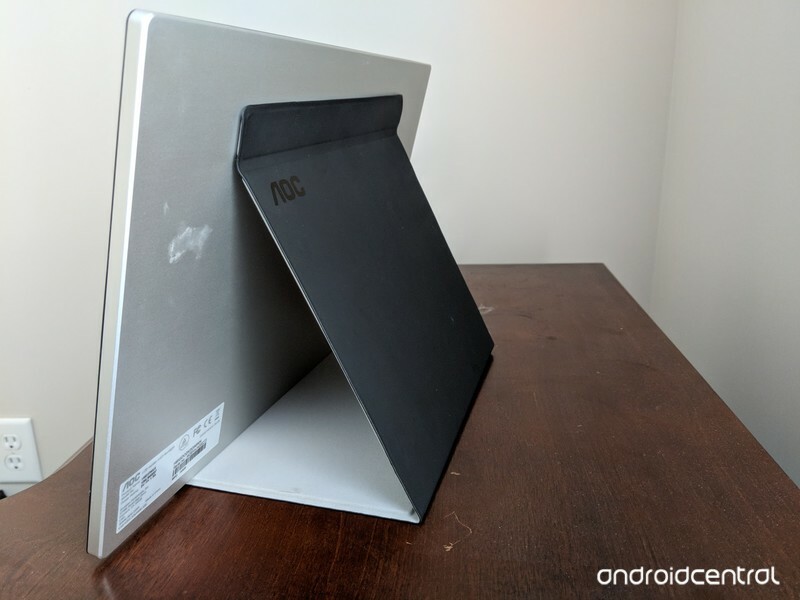 Spend a few more dollars on a tablet stand and save yourself the hassle. Brightness, stand and aspect ratio complaints aside, actually using the monitor is a joy. It starts working as soon as you plug in the USB-C cable, and it can’t be understated how much more enjoyable this makes my mobile writing. Before getting this screen, I used to spend an hour or two working on an article. With it, and I have that down to 45 minutes maximum. 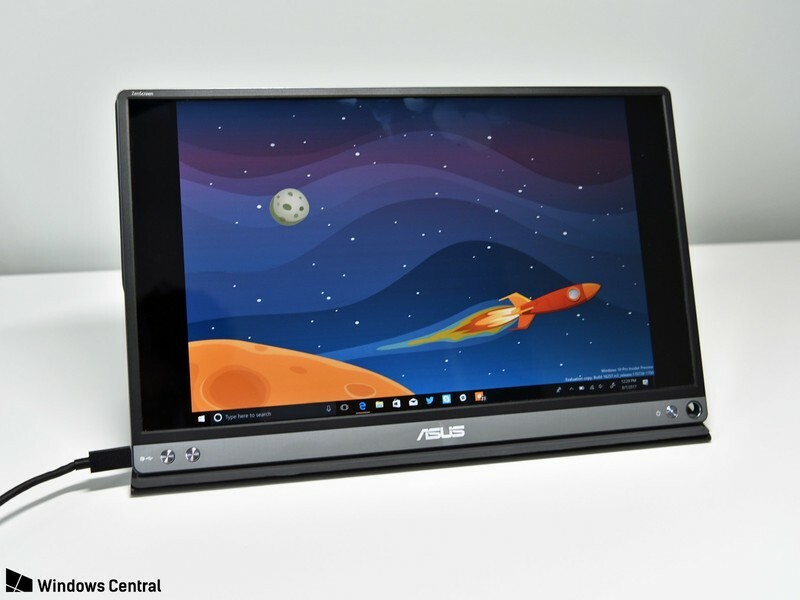 Alternatives to this include the Asus Zenscreen, which is effectively the same monitor inside a re-branded chassis. That screen has been reviewed by both Daniel Rubino and Mr. Mobile if you’re curious. Asus has a newer model coming that has a built-in battery, so it won’t pull from your laptop all the time. This should also — in theory — connect it to older laptops with an HDMI or DisplayPort to USB-C cable, since you won’t need to worry about transmitting power. A second laptop screen is the epitome of a first-world accessory: it’s not necessary, and for most people, it will be redundant. But, if you enjoy writing on the go and want some extra real estate, this will legitimately make you more productive in the same way a second desktop monitor would. This screen is $50 cheaper than the comparable Asus model, making it a win if you want to expand your mobile workstation. If you work on your laptop a lot and want an easy way to get more screen real estate, it’s hard to go wrong with this monitor.